No one in the house was prepared for Angelo's death. Everyone was walking around the house depressed for days. No one was eating hardly anything, and no one could get one night of good sleep. The younger kids were confused as to why their Grandpa had died. They didn’t understand the concept of death since they were so young and explaining it fell onto Damen, Gretchen, or Cian. While Cian was trying to get food into Jax’s stomach, and his own, Jax asked the inevitable question. Jax: Why did Grandpa die? Cian: Because everyone dies eventually. Do you remember when we met Grandma for the first time? Cian: Well Grandpa is with her now so there is nothing to worry about, okay? Now finish your hamburger. 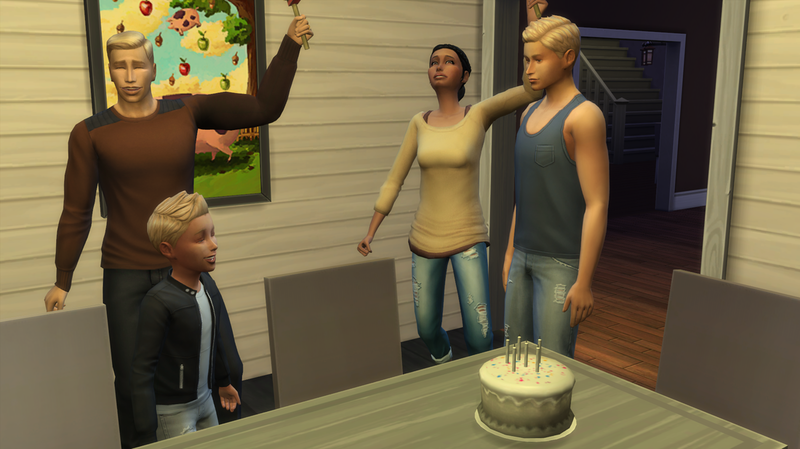 In the wake of Angelo’s death it was time for Myles birthday. Gretchen was more than willing to do anything that would get her mind, and her families, off of the tragic death. While Gretchen was in the kitchen preparing for the party Myles came in and tugged on her shirt. When she looked down at her son she realized that something was very wrong. Quickly she leaned down and wiped a tear off of his face. Gretchen: Myles, sweetie, what’s wrong? Myles: I just...I don’t want to have a birthday party. Gretchen wasn’t expecting that. Myles always loved parties and had been talking about his for ages. Gretchen: Why don’t you want one baby? Myles: I don’t know I just...it doesn’t feel right without Grandpa around..do you think we could celebrate with just us? Gretchen stood up and brought her little one into a tight hug. She ran her hand through his blonde hair and kissed the top of his head. Gretchen: Of course baby. It’s your birthday so we’ll do whatever you want. Everyone tried to put on a happy face for Myles birthday and it seemed to work for a little while. They all managed to make him smile and Celine even got a laugh out of him! Myles grew up into a handsome young man and gained the Clumsy trait. He looks almost like the perfect mix of both Damen and Gretchen. The aspiration he rolled was Chief of Mischief (oh boy). 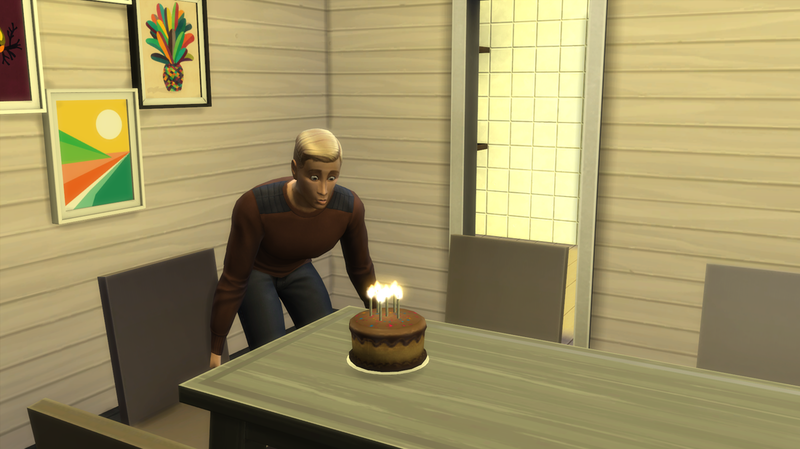 To get it out of the way Damen decided to celebrate his birthday too. 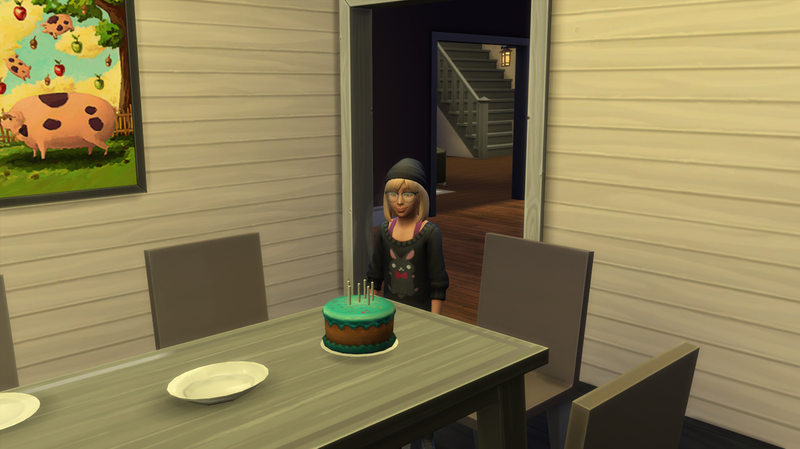 Everyone was already around so he asked Gretchen to make him his favorite cake and to slap some candles on it. It wasn’t that he was looking forward to getting old. He just wanted to get it over with already. Damen: Ohhhh my back! How could Dad stay this old for that long?! Damen: More power to ya Pops, I couldn’t do this for as long as you did. 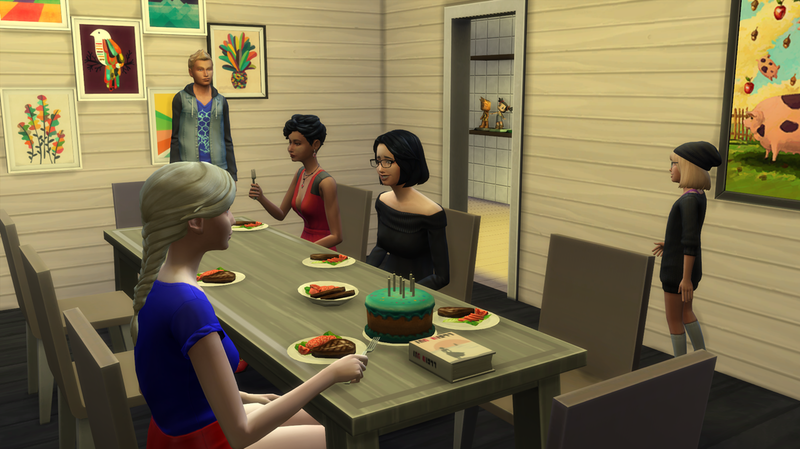 The Belle Estate was just full of birthdays coming up! It seemed like the prospect of having a giant get together with the whole family really pepped up everyone's spirits! It also helped that it had been some time since Angelo had passed away and even though the wounds weren’t completely healed, they were getting there. Celine: As soon as I grow up I’m going to start working on my skills and then I’ll work extra hard on my speech and then maybe just MAYBE I will win the heirship! Isabella: What?! All I said was that I’m a young adult and I still have no idea what Wooho is! C: Didn’t your Mother ever explain it to you?! Isabella: Well no Auntie..that’s why I’m asking you guys! Why does Aunt Charlotte look like she’s about to pass out? Myles: Oh for plum sake Isabella, even I know what Woohoo is! Jax: Myles what’s Woohoo? Is it a type of cake? C: Okay Izzy, I’m just gonna go talk to your Mom real quick. After Gretchen practically had to drag her sister back into the dining room and away from the very bemused Grace it was time for the big moment! First up was Celine (of course). Celine: Pleaaase let me grow up pretty and smart! And the youngest of the Belle bunch was up next! Unfortunately Uncle Castiel had a little too much juice to drink and was singing very off key. Castiel: Happppyyy Biiiirthdaaaaay tooo youuuu! Celine: Oh my plum, Cian, please tell me you are recording this!? Cian: Of course I am! Look! Celine: Oh this is so being shared on Simbook. 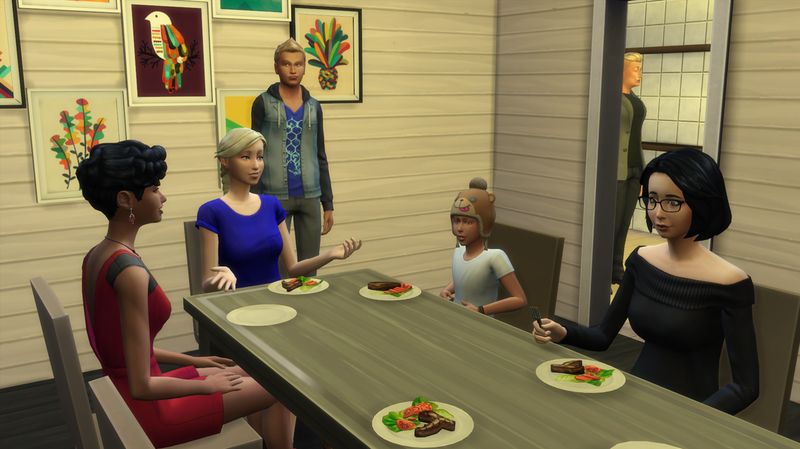 Celine grew up beautiful just like she wanted and gained the Outgoing trait. Which I think we all know was hidden in there somewhere! She also gained the Mansion Baron aspiration which will be easy to accomplish since we practically already have a mansion! 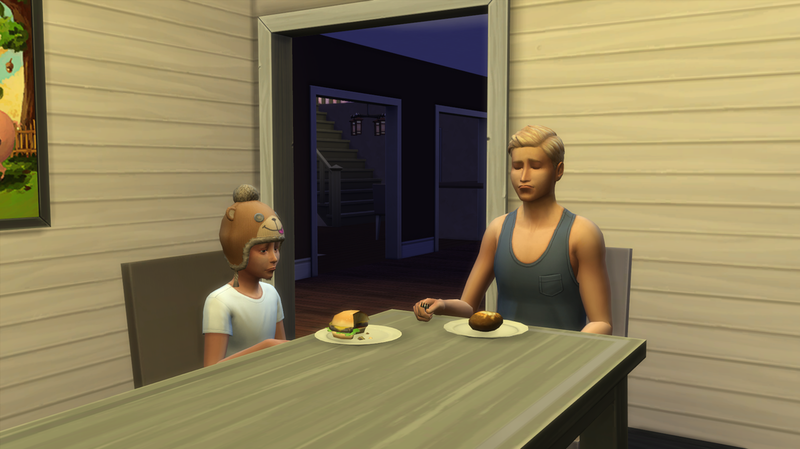 Jax grew up into a cutie, just like I expected, and inherited the Gloomy trait from his Dad. Since he was the one that seemed most affected by Angelo's death this probably held a key factor in him gaining this trait. 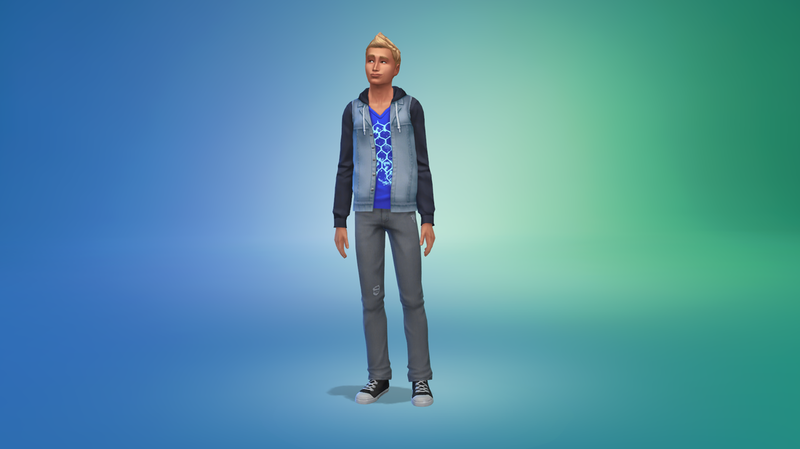 But for the first time in my history of playing the Sims 4 , Jax rolled the aspiration to be a Joke Star! That should be pretty interesting to do! I’ve never had a Sim go into the Comedian part of the Entertainer branch before. 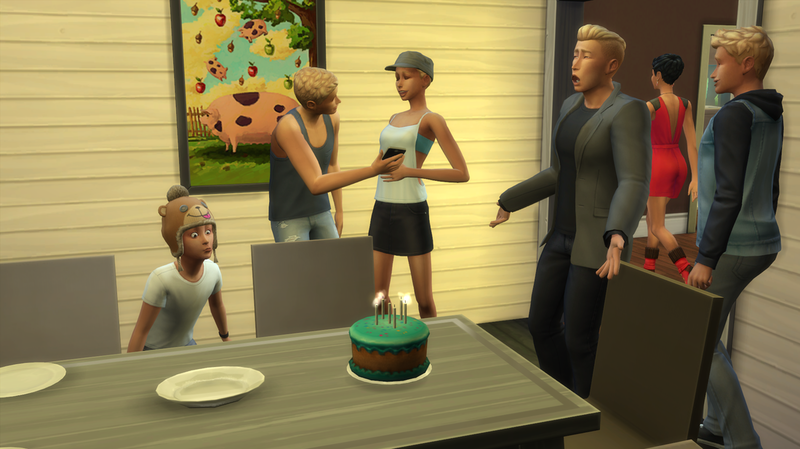 The party was drawing to a close but the twins were still extremely excited to be joining their brothers in being teenagers. Jax seemed a little more excited than usual, probably because his goofball trait had kicked in and he was acting wacky. Jax: Can you believe we’re teenagers?! This is going to be so friggin awesome! Celine: Yea it will be, but you better remember to do your homework! I’ll be focusing on school a lot and you only graduated elementary school with a B! Jax: Pfffft school schmool! I’m gonna be a comedian someday! Who needs school? Celine furrowed her eyebrows together and started to go off on a rant about how doing good in school will give you better job opportunities but before she could finish Jax had run off to watch TV with their cousins. Frustrated, Celine put her palm on her forehead and sighed. Celine: What am I going to do with this boys? 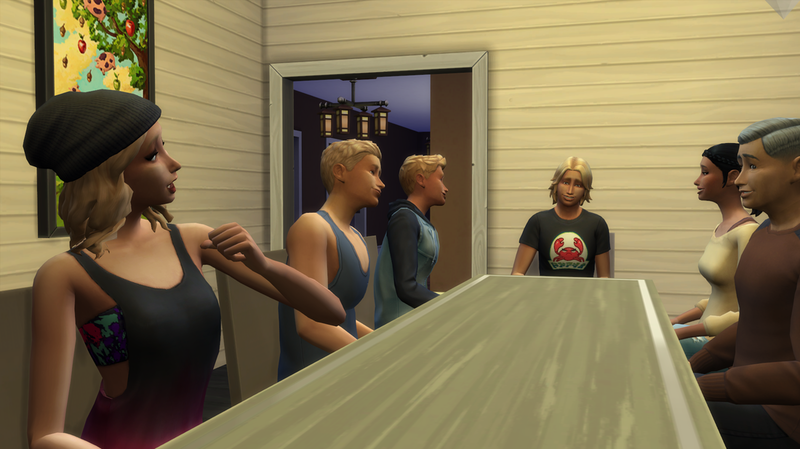 The next morning Gretchen and Damen sat all the kids down to discuss the legacy. It was finally time to have the heir talk. Gretchen: Kids, you all know why me and your father called you down here this morning. Damen: And we want you all to know that no matter what happens we will all love you to the moon and back. Gretchen: So without further ado, your Dad will explain to you what being the heir means. Damen: The role of heir in our legacy is not given to the first born son or daughter. It is chosen by the community. My Grandmother, your Great Grandmother, Violet Belle started this legacy from the ground up and it was her decision to have it where any single one of the heirs offspring could be a potential heir. Of course there are stipulations, such as the child must be born and raised on this plot of land and they may never move out, if they want to become heir. All of you must participate in the Heir Speeches. You must come up with a speech that you think could win over the community and give you the best chance at becoming heir. Now the thing is, is that you must not LIE in your speech. Me and your Mother will be going over them before they are submitted to the Newcrest Newspaper and we know you from the tops of your heads to the tips of your toes, so don’t even try to pass one on us! Celine: But Daddy what if there is a tie in the votes? Damen: If it comes down to that, then the heir will be chosen by your Mother and I. Though I doubt that will be the case I don’t want you all to think that we will be picking out “favorite” child. We will be basing our decision of your speeches just like everyone else will. All the children nodded their heads in sequence and as soon as Damen said he was done talking, Gretchen and him were bombarded with questions about what was the best thing to put in their speech. Unfortunately Damen didn’t really have a good answer since he basically did his only halfway..
Myles: You guys know I bet I’ll win because I’m a genius and could bring in the most money for the family! 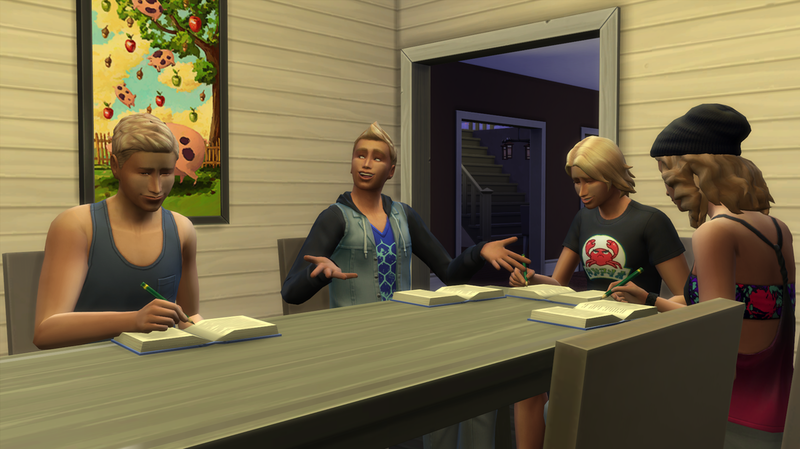 Cian and Jax laughed at their brother, but Celine was extremely quiet and seemed to focused on her homework to even care what they were talking about. Cian: Yea and I bet I’ll win because I’m good at fishing huh? Jax: Oh yea and imagine a Comedian as the heir! HA! This legacy really would be a joke then! Celine: STOP IT! This legacy isn’t a joke! These speeches aren’t something to make fun of! This is our family's livelihood on the line! You guys can’t make a joke out of that, anything but that okay?! The guys stared at their sister with wide eyes and their mouths dropped open. When they all realized that Celine was actually hurt by the joking, the room immediately fell into a hushed lull of pencils scratching on workbook pages. Jax especially felt bad about making the joke about the legacy turning into a joke, he didn’t really mean it but he understood how much this meant to his twin sister and that put a little tear in his heart knowing that he hurt her feelings. Later that night Celine needed to get away from everybody for a little bit and decided to start working on her skills. Being the geek that she is, she decided to pursue programming since she aspired to be a Tech Guru someday! Celine: Okay let’s see here...I could try and learn Slash, or maybe try my hand at S++! Hmmm...why don’t I just try out both?! 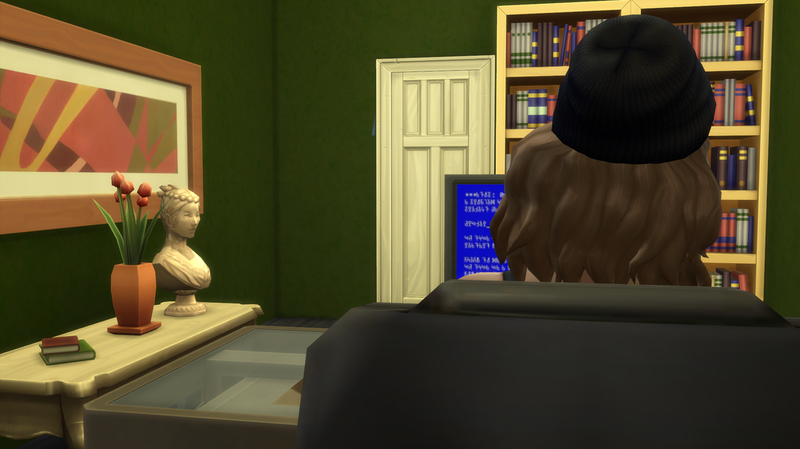 Celine: Ooooooo, Momma’s gonna be so proud of me when she learns I learned how to do all this cool programming! Celine:............Plum. I broke it already. After a long night of programming, 3 hours of sleep, and two cups of coffee later, Celine stormed into her brother's bedroom and shook all of them out of their sleep. Celine: Come on guys! Let’s go to the park today! We haven’t been out of the house in foreveeeer! 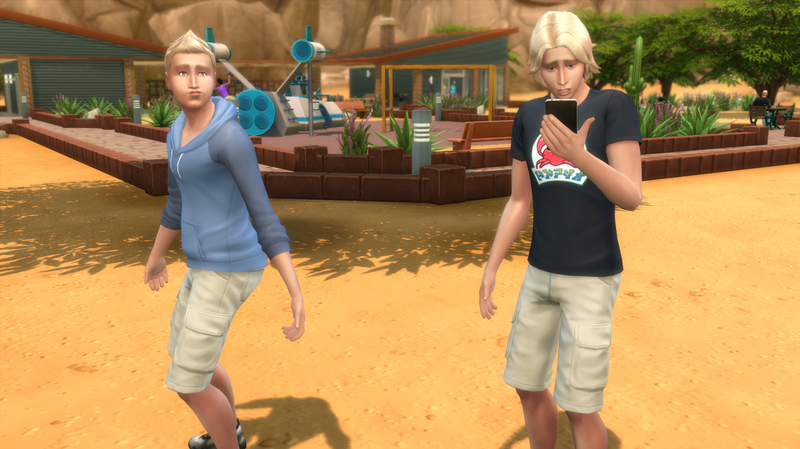 Myles & Jax: *muffled* Uggggghhhhhhh. 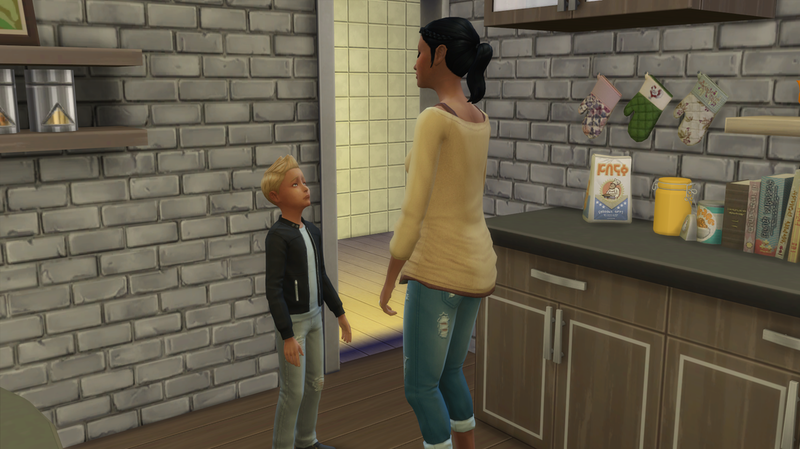 Cian: Wow sis that Outgoing trait is going to be the death of Myles and Jax. Celine: Pffft, they better get use to it! Now up and attam guys! Let’s go on an adventure today! Unfortunately Myles and Jax were late getting up and didn’t make the taxi that Cian and Celine took so they were a little late to the park. Jax: AW what the plum, man?! There’s no service out here! Myles: *whistles* Welp I think dear ol’ sis did that on purpose. While Jax and Myles were lost at the park, Celine was having a heated game of chess with her Uncle Castiel. Celine: Uncle Cas, I am totally gonna wreck you. Castiel: Giiiiiirrrrrllll you just accepted an invitation for a chess whoopin’! 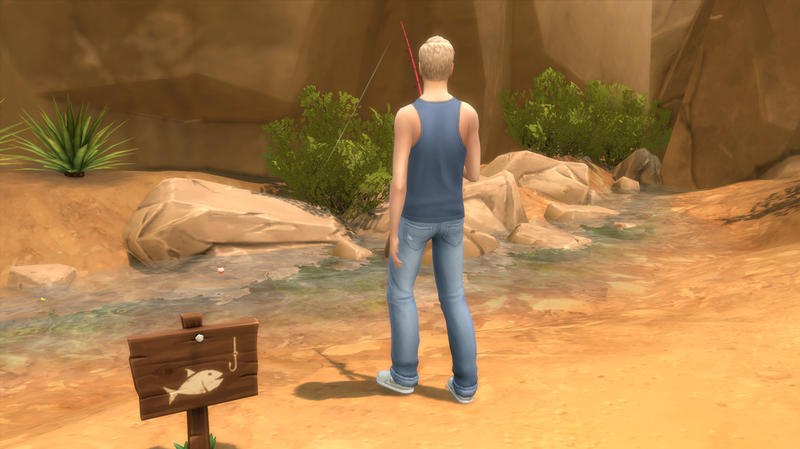 Of course being the aspiring angler that he was, Cian was trying his hand fishing in a….dried up riverbed? Cian: What the plum man!? Celine takes me out to the park and here I am thinking it’s going to be some lush green oasis with glorious blue ponds! No, NO! Instead I am stuck with a riverbed that is almost completely dried up! Celine: AW MAN!? What the heck?! Castiel: Told you you would be the one to get wrecked! Castiel: Awww Cici don’t be like that! You make me feel awful when you give me that face! Jax: Celine! Why did you bring us to a park with no cell service?! Celine: Uh isn’t it obvious?! You guys are always on your phones and it’s about time we all spent some time together! Jax: Well...well how are you supposed to post anything to Simstagram or or update your status on Simbook?! Celine: Oh, oh no! What ever will I do if I can’t take a selfie of myself at the park?! Jax: Oh for the love of- Who is supposed to be the comedian here?! Celine: Obviously not you since I’m the one raking in all the laughs! Jax: Uh huh. And you exactly is laughing? Celine: Me, myself, and I! The sarcastic moment was interrupted with Castiel bursting out into a hearty laugh that lasted a good couple of minutes. Castiel: You kids crack me up! The only thing Opal and Mark do is fight. This is a welcome change! 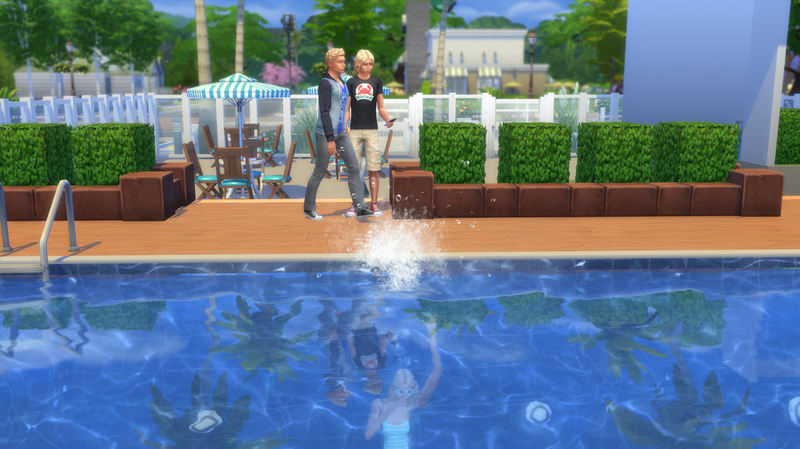 After saying goodbye to their Uncle and spending a little bit longer at the park, Celine convinced the guys that they should go to the neighborhood pool and go for a swim. Jax: You’re jumping in with your sunglasses and shoes on! Jax: Oh well, too late. Jax: HA! One of her flip flops floated up! Totally taking a picture of this and posting it on Simstagram! *camera clicks* Sister jumped in the pool with her sunglasses and flip flops on! #toexcitedforthepool #weirdosister #belleantics. Annnnnd post! Myles: Did you just post that, for real? Myles: Ohhhh you’re going to be in a world of pain once Celine finds out you posted that. You remember how she got when you posted that “before makeover” picture on you guy's birthday? Jax: But there isn’t a delete option! Myles: Hey man that’s your problem not mine! Celine: So while I was using the bathroom I saw you posted a new picture on Simstagram. Jax: Hahahahaha. Wow really? Which one? I’ve posted like five today. Myles: Duuude busted. Mine as well fess up now! Jax: I CAN’T, I DON’T KNOW HOW! Celine: SOOGLE IT YOU OAF! Jax: ALRIGHT ALRIGHT JUST STOP TICKLING ME! They had all gotten out of the pool and were getting ready to head home after they had all had a little snack from the cooler they had brought. 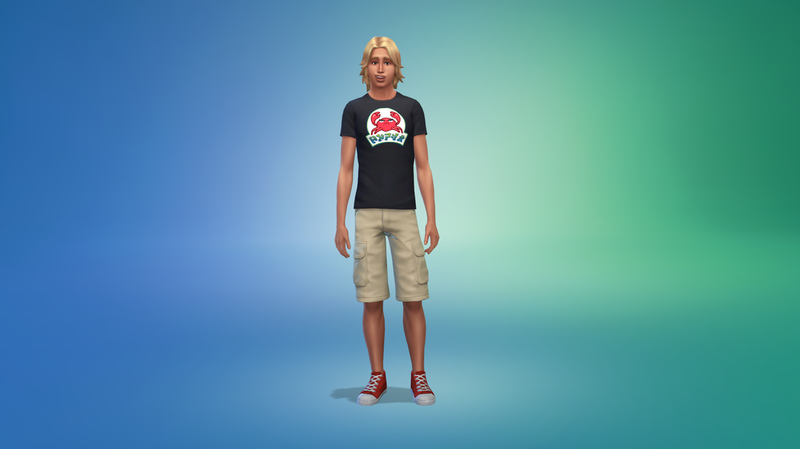 Jax on the other hand was not having a great time because he still hadn’t figured out how to delete the Simstagram post. Jax: Dude I still haven’t figured it out! Cian: Don’t look at me! I don’t want any part of this! Jax: Come on man! Help your brother out!? Celine was quietly sipping her water when she reached out her hand to Jax and looked over the rim of her sunglasses. Celine: Lemme see your phone. Nervously Jax took out his phone from the backpack they had brought and handed it to Celine. After a few minutes of pressing buttons on the screen she handed it back. Jax: What in the….CELINE! You DELETED my Simstagram?! Celine: How else was I supposed to get the picture down? 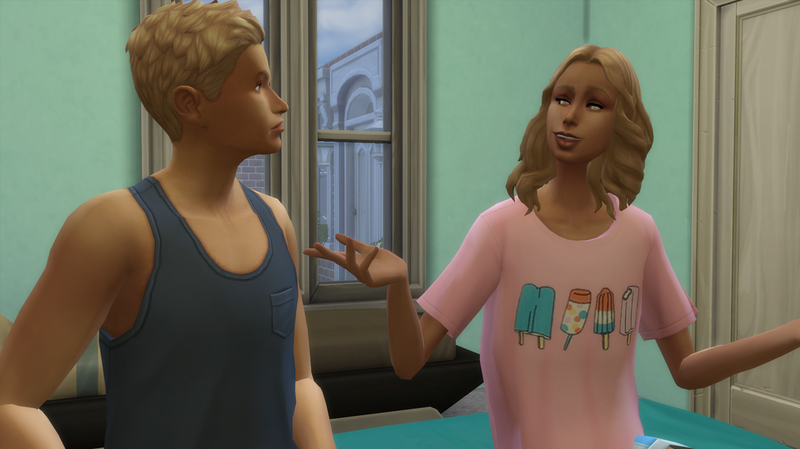 Flabbergasted, Jax stared at his sister in shock and all Celine did was stick her tongue out at him and finger gun him again. When they all got home Gretchen was still preparing dinner for everyone so Celine took this time to go outside and start practicing doing yoga. She didn’t really like to run on the treadmill and didn’t want to get buff lifting weights, so this was the best alternative. It wasn’t as hard as she expected it to be and contributed that to the fact that her Grandpa was a very athletic individual. He was partially the reason that she even picked up doing yoga. Gretchen had made breakfast for dinner and after almost everyone was changed into their pj’s it was finally time to eat. Gretchen decided this was a good time to ask how the speeches were going. She knew that she had to send them in today so she decided it was now or never that she would ask. Gretchen: So kids how are the speeches coming? Celine: Great! Mine is already almost done! Cian: Eh, I think I have writer's block. Myles: Um well...I have the first couple of sentences down? Gretchen: Well they are due tonight so you better hop to it!